Place corn in a large bowl, cover with water, and let sit 8 hours to overnight to re-hydrate. Drain corn and spread it in an even layer on a large baking sheet. Pat dry with paper towels. Air dry for 20 minutes. Place corn in a large bowl. Add oil and salt. Stir until evenly coated. Place corn in batches in the basket of the air fryer in an even layer. Cook for 10 minutes. Shake basket and cook another 10 minutes. Shake basket and cook 5 additional minutes and transfer to a paper towel-lined plate. Repeat with remaining corn. 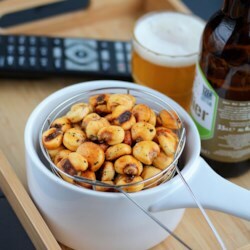 Let corn nuts cool until crisp, about 20 minutes.